Our last look at the Sea of Galilee. Yesterday was a full day – Cana, Nazareth, Har Meggido, Gideon’s Spring and many kilometres in-between. 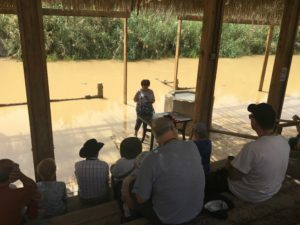 We got together under a big tree at our Kibbutz to reflect on the last 4 days – it is hard to put into words how the scriptures take on colour and meaning when they are read and understood in the very place they have been spoken. 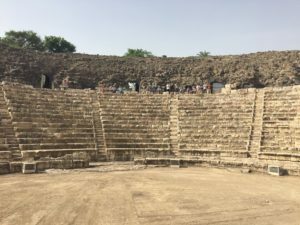 Today we stopped at the ancient Beth-Shean (check out the last chapter of 1 Samuel to see what happened here) and then moved on to the Jordan border. The beautiful ancient street in downtown Beth-Shean. 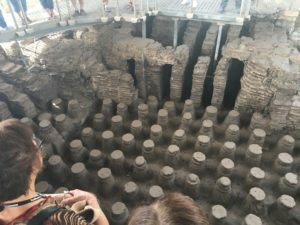 The suspension for the hot steam room in the Roman Bath – they used Venturi tubes to heat this – just like our BBQs! Testing out the theatre sound-system – wow! Looking up at the acropolis at Beth-Shean – yes, Brian did make it up and down in 15 minutes in the incredible heat. If you zoom in you can see him up there in a white t-shirt. 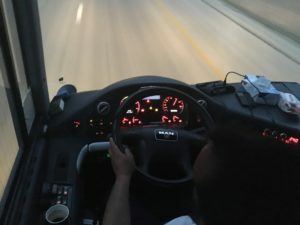 After about 2 hours of one checkpoint after another we were on our Jordanian bus with our new driver (Jeff) and new guide (Omar)…both are super! Crossing the Sheik Hussein Bridge into Jordan. 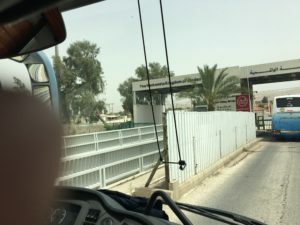 Driving in Jordan – a very different look and feel from Israel. 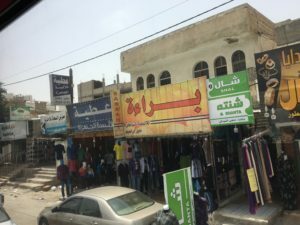 To save time we ate on the bus, quickly memorized the 4 kingdoms in Jordan (GAME acronym) and the 3 river borders between them (JAZ acronym). We drove through Gilead and the land of the Ammonites, past Elijah’s birthplace. 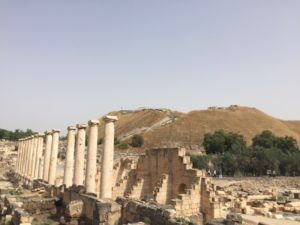 Before long we were at Bethany beyond the Jordan, on the plains of Moab, across from Jericho…the baptism of Jesus, the calling of the first disciples, the book of Deuteronomy and the first chapters of Joshua, and the taking up of Elijah all happened here. 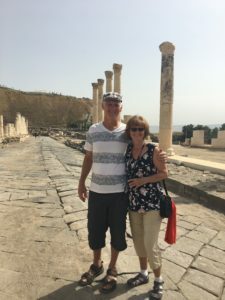 A short devotional from John 1 beside the high Jordan river, 400 m below sea level in over 40 degree temperatures and we were back on the bus climbing up to Mt. 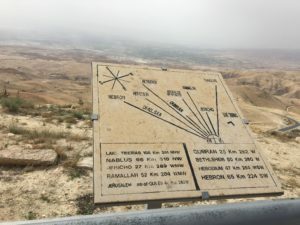 Nebo…Deuteronomy 24 tells us that Moses went up from the plains of Moab to the top of Mt. Pisgah (Nebo) and then he died…well, now we understand how that makes perfect sense. Mt. Nebo is 700m above sea level…and at times we were not sure if our bus would make the climb. 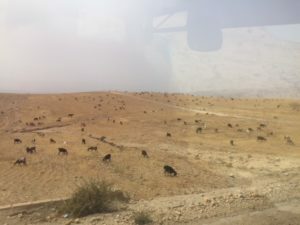 We saw a number of Bedouin dwellings and livestock along the way. At Mt. Nebo we visited the beautiful church with mosaics that are 1,400 years old and contemplated the last chapter of Deuteronomy, which tells us why Moses was such a great man. 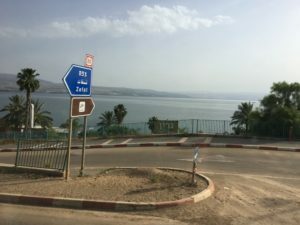 We are in Matthew 3 and John 1 – thinking about the ministry of John the Baptist at Bethany on the other side of the Jordan river. Goats and donkeys grazing on the (very brown and sparse) grass. Moses’ overlook at Mt Nebo. 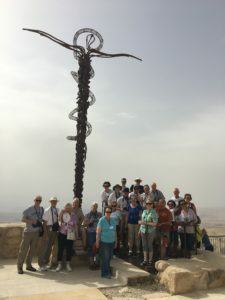 Our group in front of the monument set up in Moses’ honour. 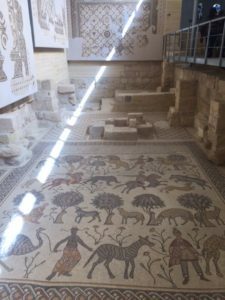 The incredible mosaics in the Mt. Nebo Franciscan church. 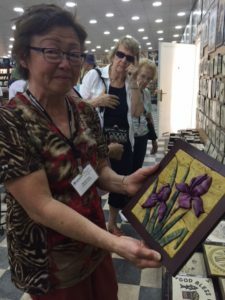 A quick stop to admire the fine mosaic artisans. We headed to Petra on the ancient Desert Highway when it started to pour – with lightning flashing all around us. Soon the desert was looking more like a flood plain. This weather is very unusual, another sign of global warming. We are praying that Petra will be opened tomorrow for us and ideally not too muddy from today’s rain. Hmmm…every single warning seems to be lit up…though the driver does not seem to be concerned. We arrived at the Petra Guest House just after 8pm…so a long day, but this hotel is great, we are looking to it being our home for the next two nights.